One of the world’s top middleweight fighters in the UFC’s Nate Marquardt will be front and center at this weekend’s International Mixed Martial Arts Expositions (IMMAE), as the popular expo takes it’s show to Denver, Colorado. Marquardt, who primarily trains in Denver, is currently in preparation for a return to the Octagon against Rousimar Palhares at UFC 118 on August 28th. He’ll be taking this weekend off, along with some of his Grudge Training Center buddies to meet several thousand screaming mixed martial arts fans. Denver has grown into a hotbed of MMA and even Marquardt has taken notice. It wasn’t until recently when Nate “The Great” saw a change in his popularity, citing a pair of wins in 2009 as the turning point. “In 2009 is really where it’s been picking up for me, after I had really good wins against Wilson Gouveia and Demian Maia. 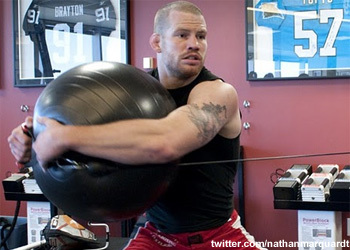 I think they replay those fights quite a bit on Spike TV, that was really good for my career,” Marquardt told 5thRound.com. Meeting with his fans is a welcomed distraction for the always accessible middleweight, who frequently utilized Twitter and his official website to keep in touch with his loyal supporters. If you’re going to be in the Denver area this weekend (July 24th and 25th), make sure you head on down to the Ritchie Center at the University of Denver to meet some of the sport’s brightest stars. Tickets can be found at Ticketmaster.com. A two-day pass can be purchased for $30, or individual day passes are available at $20 for each day. Tickets for the fight card, “Worlds Collide,” are available for $30, $40, and $50.